BioWare has unleashed the Dragon Age: Origins Character Creator and its new Social Network, giving players the chance to generate and share characters that can be used in the upcoming epic RPG. To get started, log in to the new BioWare Social Network using your BioWare forums username and password - if you don't have one, you'll be prompted to create an account. Once connected, you'll be asked to provide some further information, after which you'll be able to browse the site, the Dragon Age: Origins community, various forums and other content. A Dragon Age Wiki is available, as are options for groups, photo albums and more. While you're there, you may as well grab the new Dragon Age: Origins Character Creator, a 325 meg download featuring a powerful new trailer for the game as well as the character creator. (You can also pick it up directly here.) Choose from one of the many exciting combinations of human, elf or dwarf and fighter, mage or rogue, then upload your character to EA and share it with your fellow Dragon Age fans. What's the point, you ask? Not a lot, really; I can just about guarantee it'll take you longer to download the Character Creator than to actually create a character. But once it's uploaded, you'll be given links to a description of your character's background, origin video, wallpapers and more. You'll also be given access to the Lucky Stone, an old ring that grants +1 to each attribute when it's worn. 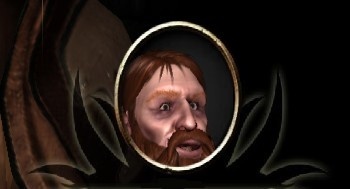 I've already given the character creator a try - I'd never ask you to do something I'm not willing to do myself - and this is what I've come up with: Faren the Simpleton, a dwarf commoner whose mighty beard can't hide the fact that he's been hit in the head once too often. Oh, you think you can do better? Take your best shot, then post the link!